With both men's and women's hockey finally aligning their schedules in Canada West, it's nice to have everything going at once. It feels like hockey season again, and with hockey season comes hockey slang. If you've listened to the broadcasts on Canada West TV or UMFM, you know Kyleigh and myself occasionally use some hockey terms that may not be so apparent without a bit of a primer. "Biscuit in the basket", "flashing the leather", and "going shelf" are a few of the terms you may hear, but there are a pile more that may need a little translating and I'm happy to see the Calgary Dinos doing their part in aiding our viewers and listeners! I'm not even going to set this one up because it's good. Here are the Calgary Dinos men's and women's hockey teams defining a few key terms you may hear around the rink this winter. "Apple", "Salad, "Suey", and "Chirp" are all defined, but I'm surprised that captain Paige Michalenko didn't know what "salad" was. You'd think she may have heard that in the past, especially since she usually has the "flow" coming out of her "bucket", but perhaps no one "chirps" Paige about her hair? 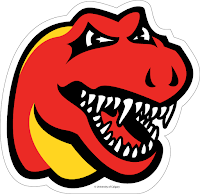 In any case, this series should continue with the Dinos. I think they should put out a new video every week prior to their games, but that might be a nightmare for their social media and video people. Nevertheless, the first installment was solid, so let's hope there's a sequel!